Is there nothing 3D printing cannot do? This macaw's beak was severely damaged, leaving it unable to eat. 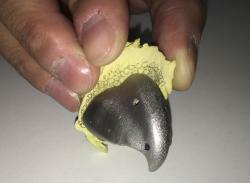 Through 3D printing, it was given a new beak... and a new lease on life! Gigi is a blue and gold macaw from Brazil, where she was living in captivity. Something happened to her beak and it was severely damaged, leaving her unable to eat effectively and threatening her life. Luckily for her, the Animal Care Center Ipiranga in São Paulo teamed up with facial reconstruction specialist Cicero Moraes and veterinary dentist Paul Miamoto to make her a new beak out of titanium. Why titanium? A bird's beak is incredibly strong, and the bigger the bird the stronger the beak. A blue and gold macaw like Gigi can exert up to 2000 pounds pressure with its beak! Titanium was clearly the only answer, and since it's used in human medical procedures (I have a few titanium screws and plates myself) it was a good choice. They even jazzed it up a little, using screws that look sort of like rhinestones to attach the titanium beak to Gigi's underlying beak structure. Because what girl doesn't like a little bling, especially one with showy colours like a macaw? First, they created a 3D design of Gigi's original beak using facial reconstruction. Then the actual titanium beak was manufactured by the Renato Archer Technology and Information Center (CTI). From there, Gigi had to undergo surgery to install her new beak. After a few days' recovery, she was eating normally with no apparent ill effects. Gigi will not, however, be released into the wild. Since she's lived her entire life in captivity she most likely wouldn't be able to make it on her own, so the Animal Care Center is seeking individuals or zoos that might be willing to give her a forever home. No matter where she ends up, Gigi and her new beautiful beak are sure to be envied by all the other birds!